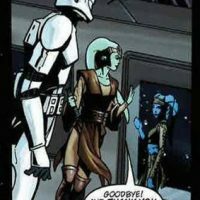 Xiaan Amersu was a female Rutian Twi’lek Jedi Knight who fought during the Clone Wars. She was the Padawan of J’Mikel, an Anx Jedi killed by the bounty hunter Aurra Sing. Dark brown leather or leather like headgear with a silver metal ornament with wide bands above the tips of the lekku. Ear caps matching body colour. Light brown lowcut tunic/shirt with long, loose sleeves and long, fitted sleeves. Can be made as two shirts/tunics. Medium to dark brown tabards which reach below the knee (front and back) and are pointed to the inner side. The tabards are wider than usual and go over the edge of the shoulders. They must not sag. Dark brown leather or leather-like jedi belt with silver buckle. Dark brown over knee leather or leather-like boots. 1 silver Lightsabers (no toy or Ultimate FX sabers allowed).